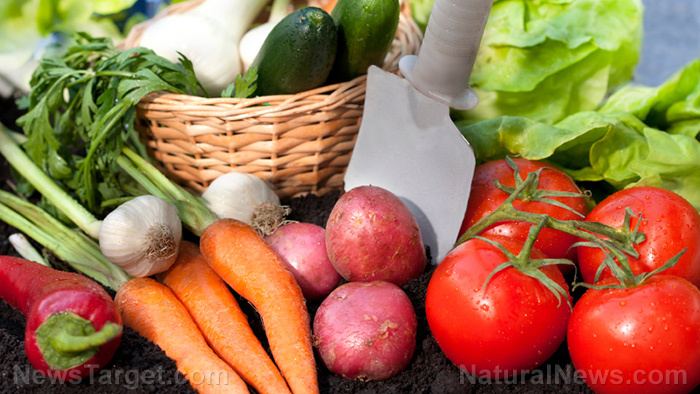 (Natural News) Home gardening is becoming more popular these days, which is largely due in part to its many beneficial effects such as lower food cost and relatively healthier produce. We have prepared an extensive list of easy-to-grow fruits and vegetables to help you kick start your own food garden. Apples – An article posted on the Thompson & Morgan website notes that apples vary in size, making it an ideal garden staple. The entry suggests planting two varieties that can pollinate each other if there’s ample space in the garden. For smaller areas, it is advisable to try planting the fruit tress in tubs. According to the article, gardeners may choose between the three different varieties of dwarf apples. Strawberries – Strawberries are among the most versatile fruits as they can either be directly planted into the ground or grown in containers, hanging baskets, flower pouches, and window boxes. Figs – Figs require a hot, sunny climate to grow. The entry notes that figs grow best when their roots are restricted. This makes the fruit an ideal cultivar among gardeners with limited spaces. Raspberries – Raspberries are among the hardiest of berries as they require very little attention. According to the article, raspberries are self-supporting and can be grown in containers or in clumps throughout the garden. Currants – Various species of currants — such as redcurrants, blackcurrants and whitecurrants — are excellent table fruits that can be made into tasty desserts and preserves. The fruits are also known to freeze well, which enable gardeners to enjoy their delicious flavor throughout winter. Honeyberries – Honeyberries resemble blueberries both in color and nutrient content. Likewise, honeyberries are noted for their relative sturdiness. Goji berries – This superfood is another tough shrub that grows in almost any sunny area. Blackberries – Blackberries are a popular cultivar among gardeners as the fruit is known to grow just about anywhere. Rhubarb – Rhubarb is known for its strong resistance against the coldest of seasons. Basil – An article published on the Spark People website stresses that basil is an ideal choice for home gardening as the plant can be grown in containers or directly into the ground. Likewise, the article notes that the aromatic herb can even be cultivated indoors on a sunny windowsill. Bell peppers – Bell peppers are a popular garden staple among gardeners, so much so that the plants can be easily purchased from nurseries and home improvement stores. Squash – Squash is an excellent cultivar as only a few seeds are required to cultivate the vegetable. Radishes – The article also notes that radishes are relatively easy to handle, especially among beginners. Tomatoes – This cultivar requires very little water and plenty of sunlight to grow well. Most people purchase starter plants from nurseries or home improvement stores, which is an easy and time-saving method in cultivating the vegetable. Cucumbers – Smaller varieties of cucumbers may do well in containers, according to the article. Spinach – The green leafy vegetable is valued for its high iron content. Likewise, spinach is an excellent addition to salads, soups and omelettes. Lettuce – Lettuce remains to be the most popular salad green. The plant’s many varieties — such as head lettuces, leaf lettuces, spinach and arugula — are relatively easy to cultivate and require very minimal care. Carrots – Carrots only require a plot of soil that is free of rocks and other obstructions. Green beans – The plant’s many varieties are undemanding and usually require minimal care. You can achieve optimum health easily with the fun guides and other nutrition-related articles on Nutrients.news.